Last month, I posted a blog entitled Kingsland’s Roots — a brief account of the birth of our church and how we have started and assisted new churches in Katy and beyond. To coincide with the first anniversary of Bethel Bible Fellowship, our third daughter church, our missions ministry has devoted our September newsletter to the topic of church planting. 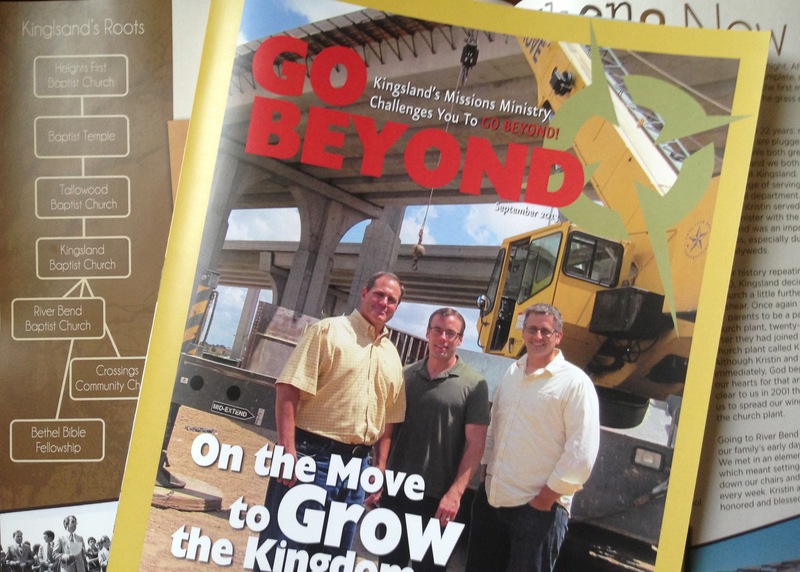 Kingsland members will receive a copy in the mail in the coming week, can pick up a copy in the commons area outside the worship center, or can access an online version of the newsletter. Church planting is a key component of our church’s vision statement. When I started my service as Kingsland’s missions pastor 8-years ago, Pastor Alex stressed to me the importance of fulfilling that part of our vision statement that states: “As a church that participates in the Great Commission we will continue to birth daughter churches as quickly as the Lord provides people and resources.” The generosity of Kingsland members enabled us to help start two new churches during that period and to assist many others. I encourage you to read our next newsletter from cover to cover. You will enjoy reading reports from John Crowe of River Bend, Matt Powell of Crossings Community Church, and Paul Cockrell of Bethel. These are three really good men who care deeply about leading their respective churches to lovingly reach into every sector of our community. You will also read about why planting churches is strategic to reaching the six-million people who live in the greater Houston area and why we must remain committed to this greater vision of growing the kingdom. We have included a family tree in the newsletter that will show you at a glance where Kingsland came from. Perhaps the most compelling thing about our church’s family tree is wondering what might have happened if those who came before us had not had a vision that extended beyond their respective campuses and beyond the immediate future. There might not be a church called Kingsland — a body of believers committed to loving God, loving people, and equipping the generations one home at a time. My hope and prayer is that we will remain committed to a vision of reaching the lost, a vision that extends beyond our campus and beyond our lifetime, and a vision that compels us to invest in growing the kingdom. And, because the nations are coming to us, we must stretch our church-planting vision to include starting churches that will reach the one-million people among us who were born outside of the Unites States. Thank you Kingsland, for having a vision that extends beyond our generation. Only heaven will reveal the full impact of our determination to be a church-planting church that plants church-planting churches.